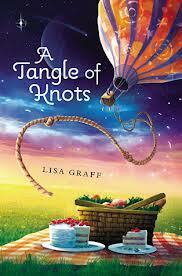 Goodreads Summary: Told in multiple viewpoints, A Tangle of Knots is a magnificent puzzle. In a slightly magical world where everyone has a Talent, eleven-year-old Cady is an orphan with a phenomenal Talent for cake baking. But little does she know that fate has set her on a journey from the moment she was born. And her destiny leads her to a mysterious address that houses a lost luggage emporium, an old recipe, a family of children searching for their own Talents, and a Talent Thief who will alter her life forever. However, these encounters hold the key to Cady’s past and how she became an orphan. If she’s lucky, fate may reunite her with her long-lost parent. First, I’m going to be totally honest and admit that I checked this book out from the library because of it’s cover. I’m sure many of you will agree that it’s just a beautiful cover. Don’t you just want to jump right in and join the picnic? Unfortunately, for me, the story didn’t live up to the cover. I found it too confusing and rambling. However, this is one of those times when, knowing my students as I do, I strongly suspect they would really enjoy it and have no problem with the book. I’m working on the plans for a book club for next school year (part Mock Newbery and part general book discussion.) I’ve added this book to the list of potentials for the club. If my students do read it, I’ll be sure to update you on their thoughts. And maybe I’ll just frame a copy of the cover for my wall.